If you go to any serious company you will find that they have automated tests running for every new update in the codebase of the programs they develop. This assures that every random thing some developer fixes, doesn’t break something else in the program. In most cases you will find Jenkins or some of the commercial solutions like Travis and CircleCI for this. As a metro-sexual hipster developer however you want something that is fast to setup, easy to use and minimal. To be fair there is a huge amount of open-source free continuous integration (CI) programs that do this. On my recent hunt however I found one that shines amongst them: StriderCD. In this tutorial I will setup Strider so that it works even if you sit behind 9.000 firewalls in your company. I will also set it up so that you can move it around and reuse it in the future without the hustle of setting up things from the beginning. For this I will use Docker ofcourse, the hipster’s French wrench. I will also make it so that you can run other containers inside the container where Strider runs. This is helpful if you want to run tests inside their own container for example. To be sure that you have the latest Strider it is wise that we build everything from scratch. I have created a Dockerfile that will make an image with the latest Strider and setup everything up so that you can use it with Docker. sudo sh -c "echo deb https://get.docker.io/ubuntu docker main &gt; /etc/apt/sources.list.d/docker.list"
docker build -t strider:barebones . preprocess is a simple shell script I made that will edit the Dockerfile so that in the next step where we build it, it installs the same Docker version as the one outside of the container. This is critical since if the Docker inside the container is different from the one outside of it, we won’t be able to run Docker inside the Strider container. This will run the container with the database stored at $PWD/data/db. That way if for whatever reason the container stops running, we have all the user accounts, projects, etc. intact. Notice also that I use the --privileged flag. This is merely so that we can run containers in containers. To verify that everything works open your browser at http://localhost:3000 and you should see the login page. Notice that you won’t be able to login to Strider at this point since my Dockerfile recipy keeps things minimal – that means no user accounts by default. Adding accounts is super-easy and you don’t even have to restart anything so that won’t be a problem. In order to add an administrator account to Strider you just have to access the running container and create a user from within. If you use an older Docker you can use my tool docker-enter. If you run Docker 1.3+ then you can use docker exec. Follow the instructions to make a new account. Then just exit the running image and just refresh the webpage http://localhost:3000 (no need to restart the running image). You should be able and login in to Strider with the credentials you just gave! Remember to replace username with your own username at the Docker registry. Once all this is done, you can run directly strider from any computer. The image will be downloaded automatically. 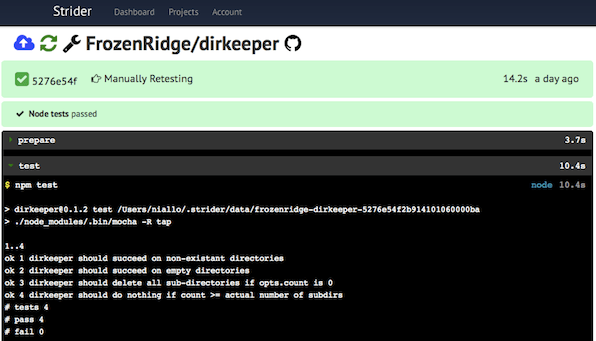 If data/db is not at the directory where you try to run Strider then a fresh database instance will be used. Categories: Uncategorized, Web | Tags: cd, ci, circleci, continuious integration, contunious deployment, jenkins, strider, testing, travis | Permalink.